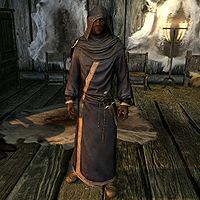 Falion is a Redguard conjurer and resident wizard of Morthal. He is a master level trainer in Conjuration and also sells magical equipment and spells at his house. If you catch him at a strange place in the marsh from 1am to 5am, he will be ready to pay you gold to keep his night activity a secret. His curious activities also relate to his study of vampirism and the undead, so should you ever require the service, Falion possesses the power to cure vampirism, if you bring him a filled black soul gem. As a scholar of Conjuration, he claims that he traveled the planes of Oblivion, and met Daedra and even Dwemer. While he was studying "life-extending magics" he met with several vampires, and contemplated becoming one of them, but in the end chose not to as it would put his apprentice Agni in danger. He briefly taught at the College of Winterhold, but left due to his hatred of the place. He moved to Morthal to further his research and to help keep the place safe. He has also been taking care of Agni after the loss of her parents and is training her as his apprentice. While she seems to trust him, most of the villagers are wary of him and think he is up to something sinister, though Jarl Idgrod ignores their complaints and supports his presence. Due to his dislike in town, it's not public knowledge that the local innkeeper at Moorside Inn is his sister, Jonna. He wakes at 8am to unlock his house and sell magical items and spells, interrupted by a three-hour nap at 3pm. He can be found wandering around the house, cleaning the place, using the arcane enchanter, sitting at a chair or conversing with Agni. At 8pm he locks the house and closes his business. He sleeps for one hour at midnight before he travels to a strange place north of Morthal, staying there for four hours. He returns home at 5am and goes to bed. Falion wears blue mage robes and a pair of boots, and is equipped with an iron dagger. He carries a key to his house, as well as a selection of higher-class items and gold. Upon your first time approaching him, he may remark on your arrival: "You are new to Morthal. We have not spoken before. This is interesting." Once you engage in conversation with him, however, he will be less friendly: "If you stand before me to accuse me of sacrificing children, or eating the hearts of the dead, you may save your breath. Beyond that I seek only to be left alone to pursue my research." You can either ask him what he does. He'll answer, "I keep to myself. I offer spells and scrolls to those who need them, and wisdom in Conjuration magic for those who wish to learn." and again say, "Beyond that I seek only to be left alone to pursue my research." Another option is to ask why anyone would accuse him of that. He'll tell you with disdain, "The people of Morthal would much rather weave their own horrid tales about my life than simply ask me for the truth. If they choose to fear me in their ignorance, that is their choice. But it will not change what is true." When you enter his house he will greet you: "If you are here to purchase, I have many spells available. Do come in." or "Welcome. There are many things here that cannot be found elsewhere." Alternatively, he can be found warning you of the dangers around the town: "My talents are much needed here, in order to keep Morthal... safe. ", "Morthal is a troubled place, and it is my duty to see it rest in peace. ", or "Please remain indoors at night. It is dangerous to go outside." If the Stormcloaks take over Morthal and Sorli the Builder is installed as the new jarl, he may comment on it: "The changes in Morthal are of little consequence to me. So long as the laws are upheld, I do not care who does the upholding." You can ask him why set up shop in Morthal, and he will respond, "As anyone will tell you, Morthal can be a dangerous place. My... talents... are useful here. I help maintain order, even if it goes unnoticed." Should you ask him to tell you about Morthal, he'll give you some advice: "The marsh is treacherous. You would do well to not wander at night." When requesting Conjuration training from him, he'll say to you, "You deal with powerful forces. Take care they do not overwhelm you." "Why should I keep this a secret?" "It is none of your concern, I assure you. Just... Forget that you ever saw me here." "I want to know what it is you're up to." "I am under no obligation to tell you anything. Now, leave me at once and never mention that you saw me." "If you want me to keep quiet, it's going to cost you." "Is that so? I should have expected as much. Fine, I shall give you 200 gold, and you shall leave me in peace. Now go, leave me to my work." "Okay, I'll leave you alone." "Thank you. I will not forget this." "He's casting spells out in the marsh in the middle of the night." "Never mind. It's not important." "Ah, so it is not just dreams then. I have seen this. I will see that it is dealt with. Thank you for bringing clarity." "I see. If something does happen, you know where I am." "Is that so? Well, I'll make sure that's taken care of immediately. It's good that you brought this to my attention." "Either this is some kind of a joke, or you're keeping something from me. Whichever it is, I don't like it." Should you choose to rat out Falion to the jarl, she will permanently follow Falion without interaction, though leftover dialogue in game data indicates that either jarl was supposed to confront the wizard. 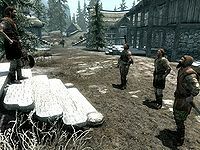 If you're a vampire, asking innkeepers for rumors may yield the response, "They say Falion of Morthal has studied vampires, draugr and all matter of undead." If you are a member of the DawnguardDG, a group of vampire hunters, they will not be available for conversation and will instead direct you to Falion to cure yourself. Speak to Falion and mention to him that you've heard he's an expert in vampirism. He'll respond, "I know many things. I have studied things beyond the reach of most humans, traveled the Oblivion planes, seen things one should not see. 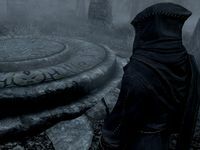 I have met Daedra and Dwemer and everything in between and I know enough to see a vampire where others would see a man." If you ask him how he can be so sure you're a vampire, he'll explain, "I met several of your kind during my studies of life-extending magics. I even considered becoming a vampire myself. In the end, vampirism would endanger my ward Agni which would defeat the intended purpose." Alternatively, you can skip the dialogue altogether and tell him you're looking for a cure. He will tell you what you need: "It is possible. I know of a ritual but I've never performed it. It requires a filled black soul gem. You will need to kill someone. When you have a gem and have filled it return to me and I will perform the ritual. I will bring life to your dead body, vampire." You have the option to ask him how you get a black soul gem. Falion will say, "They are rare things, I have one I picked up during my research of the Oblivion realms but it is a precious item." If you try to purchase his black soul gem and have enough gold, he'll reply, "I would not sell it to just anyone but I'll make an exception for you. The cost to replace the gem is quite high." If you don't have enough gold he will refuse, saying, "I believe this gem is worth more than you are at the moment." When you have filled your black soul gem, bring it to him and he will give further instructions: "Very well. Meet me at the summoning circle in the marsh at dawn. We shall banish the creature you have become." If you only have an unfilled black soul gem, he will instead remark, "Which is utterly useless at the moment. You need to fill it with a soul." "I call upon Oblivion realms. The home of those who are not our ancestors. Answer my plea! As in death there is new life, in Oblivion there is a beginning for that which has ended. I call forth that power! Accept the soul that we offer! As the sun ends the night, end the darkness of this soul, return life to the creature you see before you!" Your vision will blur and fade to black, but it will return to normal and you will no longer be a vampire. Upon completion of the ritual Falion will tell you, "The ritual is complete." Ask him if you're no longer a vampire and he will confirm, "You are human again. Like the rest of us." "We've no need for wizards in our midst!" Jorgen: "What's the Jarl going to do about it?" Thonnir: "How are we supposed to feel safe in our own homes?" Aslfur: "Please, enough already! I have told Igrod of your concerns. She'll look after you. Please, go back to your business." Jorgen: "We've no need for wizards in our midst!" Thonnir: "Morthal has enough problems as it is!" Jorgen: "Bah, it's no use. Let's get back to it then." If you later speak to Aslfur and tell him that Morthal seems like a quiet little town, he will mention why the citizens seem suspicious of Falion: "That's what many here wanted. A quiet life in a quiet place, without the noise or the trouble of a city. Now some worry this wizard, Falion, will foul it all up." Inquiring Jarl Idgrod if there's some kind of trouble in Morthal will have her answer, "That which is unknown can create unease, even fear. It is to be expected. Some fear our new resident wizard. As they grow to know him, they will accept him. Time will prove me right." Idgrod: "What troubles you, husband?" Idgrod: "Joric will be what Joric will be. Give it time." Aslfur: "Still, I fear there is some connection." Idgrod: "What decision is there to be made? I allowed him to live here. I stand by that." Idgrod: "We are all up to something, my dear. All is as it should be." Jonna: "When are you gonna do somethin' to help Falion? Stop people sayin' things about him?" Aslfur: "You have to understand, his presence here has caused... Well, it's difficult for the people to get used to." Jonna: "They got used to Idgrod just fine, didn't they? So what's the difference?" Aslfur: "Yes, well. Perhaps you're right." If you are at the College of Winterhold, you have the option to talk to Phinis Gestor, also a Conjurer and one of Falion's former students. Ask him if there are many Conjurers outside the College, and he will say, "Not within society, no. Many who practice within the school of Conjuration do so on their own, secretly. Falion is the only one I know who is public about what he does. He was once my teacher here, but left the College years ago." Asking him why Falion left will have him reply, "He didn't like the Arch-Mage. Hated dealing with him, hated having to answer to him. Falion said he hated what this place was becoming. So he just left. Aren found a note on his desk, and that was it. I understand he settled down in Hjaalmarch, and his presence there caused something of a problem." "Have no fear. I believe it is within you to excel in your studies." Agni: "When I grow up, will I go to the College in Winterhold?" Falion: "No, I don't think that will be necessary." Agni: "But I'm learning about magic, and that's what they do there. Shouldn't I go?" Falion: "The College is not the only place to learn about magic." Agni: "But you went there, didn't you? Isn't that where you learned?" Falion: "I was there only for a short time. Much of what I have learned has been on my own. And I will teach you. You have no reason to go there." Falion: "Have you been working on your concentration?" Agni: "Yes sir, I have." Falion: "Good. Concentration is paramount when dealing with magical forces." Falion: "Because an unfocused mind will almost certainly be obliterated. Destroyed by the forces you attempt to control and yield." Falion: "Have no fear. I believe it is within you to excel in your studies. But you must learn to concentrate!" Agni: "I had a bad dream again last night." Agni: "Is it true that you kill deer and eat their hearts?" Falion: "Oh?" Falion: "What? Where did you hear such a thing?" Agni: "I dreamt that you went away. You made monsters." Agni: "I don't know. Someone in town said it." Falion: "It's just a dream, child. Nothing more." Falion: "It's not true, I assure you." Agni: "It was scary. It was like it was real!" Agni: "Okay." Falion: "Hush now. Think no more of it." Falion: "Don't believe everything you hear, child." Idgrod: "Falion, I am disappointed." Idgrod: "You've been exploring places you shouldn't, and you know it. It stops at once, or else there will be consequences of an unpleasant nature. Do you understand?" Sorli: "I'm told that you're up to something out in the marsh, Falion." Sorli: "I don't even want to know what it is you've been doing. It doesn't happen again, or else I'll have you thrown in jail. Clear?" Despite being a wizard, Falion knows no spells. This is the merchandise found in Falion's merchant chest. These items are only available if purchased from the merchant; they cannot be pickpocketed or stolen. They are restocked every two days. This page was last modified on 1 September 2018, at 18:54.